In less than 24 hours Cochabamba, Bolivia proved (in two parts) to me that cities don’t have to compromise between culture and all the benefits cities offer, and the peacefulness of the countryside. This two part utopian day started on Saturday night with an hour of darkness. All the lights in and around the city went out, and for one hour the city was home to the million or so residence and the million or so stars. Certainly it wasn’t a smooth transition. Grocery stores couldn’t function, pedestrians couldn’t find the sidewalks, people with electric gates were stuck on one side or the other, students (and most of my friends here are students) panicked as precious study hours vanished. But we could see the stars. We could rest in darkness. I get so frustrated that with that yellow haze that lingers from dusk to dawn, how can we live in a world without darkness? 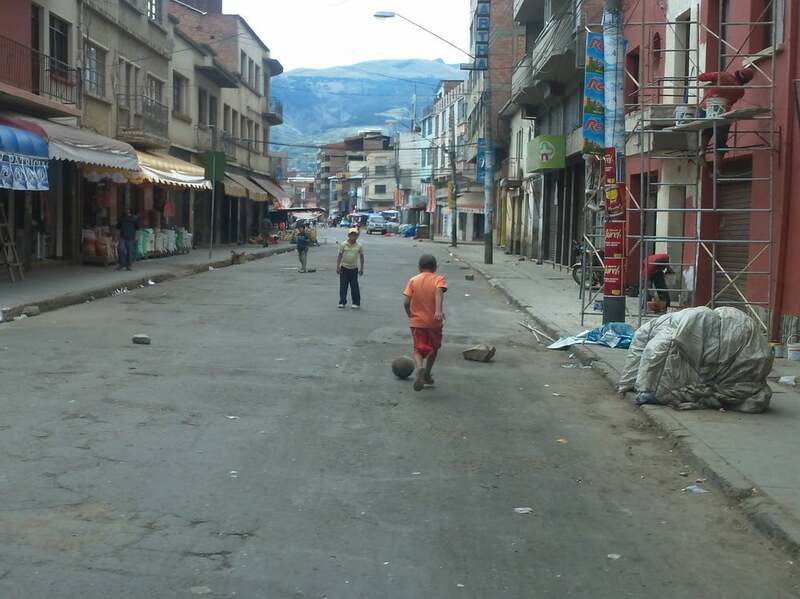 But I have drawn out that moment already in another blog, An hour for the Stars, and I will now continue on about the day Cochabamba gave the streets to the people. On Sunday the Cochabamba-utopia continued, though this time it was expected and people left their houses excited, anticipating the change. People took to the streets with their walking shoes and bikes. They walked in the middle of the road. They biked where ever they pleased. Kids on push bikes scuttled along, winding around median dividers, zigzagging like stray soccer balls up and down the streets. 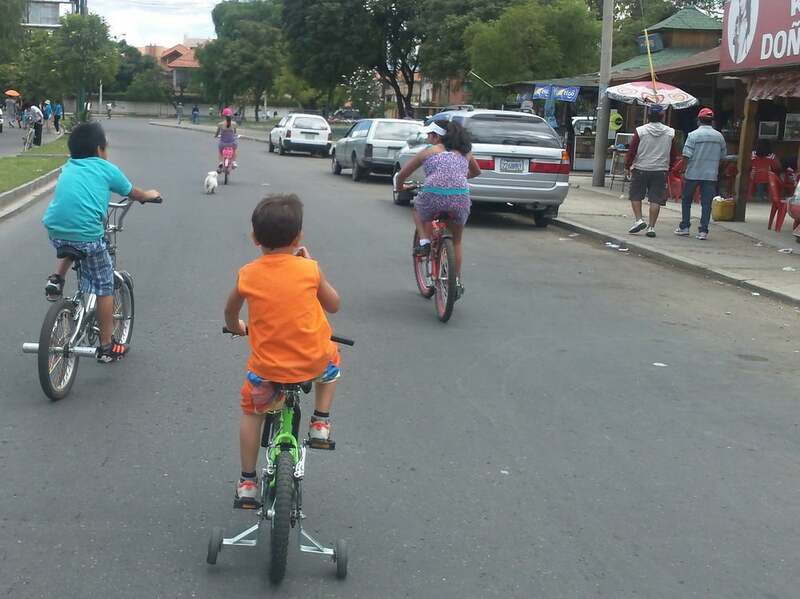 Sunday was Dia del Peton y Ciclista, or Day of the Pedestrian and Cyclist, and from 9am to 5pm cars were not allowed on ANY streets in Cochabamba. Now, I have participated in amazing car-free street moments. In Chicago I walked the ten blocks of car-free State Street watching kids build sandcastles, bands fill the air with beats, and strangers wonder without aggression. I woke up at 4:30am to experience Chicago’s biggest road, Lake Shore Drive, carless and carefree. And during college, I helped organize the yearly car-free day celebration, where one street bisecting my campus was closed to traffic, transforming the central part of our campus from a car-centric parking lot for 30, into a community place with games and art, laughing and friends, for all. It was beautiful, and incredibly hard to make happen. And here, a city of a million people, has said that for 8 hours nobody is going to drive. Chicago replaces the sounds of horns with strings. I of course, took to the streets at 9:05 am, beginning an 8 hour bike ride without cars. I rode in circles, soaking in a city free of stress, noise, angry motorists, and pollution. I rode in streets where children played soccer and parents didn’t have to worry that a speeding car would kill their baby. I rode in streets where bikes cruised down every street and it was quiet enough that you could hear freewheels spinning and conversations. Laughter dotted the air rather than gunning motorcycles and the honks and revving engines of restless, impatient drivers. I rode without worrying about drivers not paying attention. I rode without navigating around the black clouds of smoke that always hang in the air. It was amazing! Sure if it was like this daily we’d have to figure out ways to get people to work and we’d have to figure out how to keep the bikes from crashing. But we would have figured out how to keep the kids and adults from being hit and killed (the CDC states that motor crashes are one of the leading causes of death, yet we treat cars like they are safe, modern conveniences). We would have figured out how to stop and turn around the rising costs of diabetes, asthma and heart disease. And we would have figured out how to keep decent people from turning into bumbling, yelling, horn-honking nutzos when stuck in traffic. You can be surrounded by cars and feel so alone, or you can be surrounded by bikes and pedestrians and feel like part of life. The murmur of cars dampen all other sounds. While people sprinkle the air with laughter, voices, and energy. When I ride my bike, I am fighting for this to be our reality. Our streets don't have to be stressful, dirty, parking lots. They can be a space for community and fun. Dia del Peton began 7 years ago in Cochabamba. Originally it was one day a year and people didn’t know what to do. Many people stayed home, or walked tentatively around the block on the side walk. But every year the energy grew. And every year more people bought bikes for the approaching day of safety. And every year more and more people came out to experience the simple joys of riding a bike or playing soccer in the street, and every year more people grew supportive of these car-free days. Dia del Peton allows everyone to take to the streets on bikes...all types of bikes. Now Dia del Peton occurs three times a year, and the streets are as busy as ever before. Now, weeks before Dia del Peton bike shops are overwhelmed with flat tires and rusted chains, and brand new bikes are taken home. 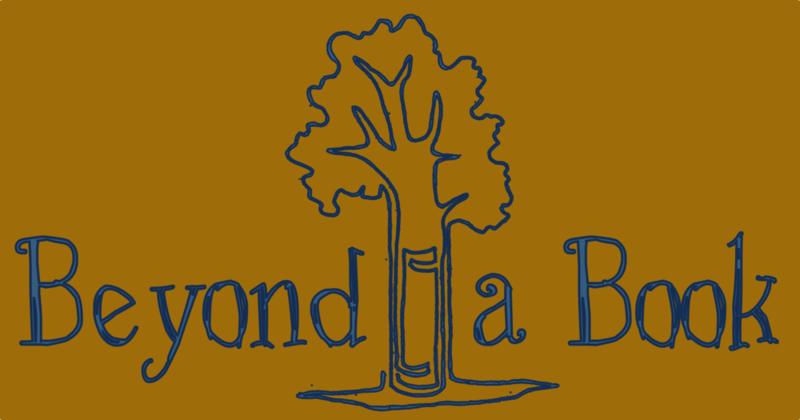 Dia del Peton is creating a culture that sees the importance of giving kids and adults the opportunity to enjoy safe, city spaces. Cochabamba and Dia del Peton, however slowly, are creating a culture of cyclists. What will it take to tell ourselves that cars are not the answer? Sure they can be part of the answer, but they are not the silver ticket. We sacrifice so much to move ourselves alone in our metal box. We sacrifice clean air, healthy citizens, peaceful commutes, safety, and community. We tell ourselves that guns and high fructose corn syrup are bad, but cars are like a trogon horse that has snuck into our lives and kept us from seeing the harm it is doing, the lives it is taking, and the destruction it is doing to our bodies, to our communities. When will we see that the solutions to so many of our problems lie in giving other forms of transportation a chance? When will we have the courage to admit that our system now is flawed and that the answer will come when we get up and decide to change? More and more people are giving the bicycle another chance. More and more people are leaving their cars at home, or simply doing without a car. And in this world run by cars, there are cities saying no thanks, we can do better; even if it is just for one day. I think Cochabamba is brave to do something like this. To admit that that we need car-free moments, moments safe to let our kids play outside, moments safe to breathe, moments free from the stress of fighting for a space to travel. Cochabamba is brave to tell the people lost in the car bubble that they can survive without driving, if only for a day. When will other cities be brave enough to move forward?